Part 4: #postitmap #micromap #green For my 2nd green map, I re-imagined a setting from my old Rolemaster campaign, the city of Tawen and its surrounds. Tosca the Mouse relates, "South of Squalo, mountains rise across the southern part of the island. The source of the Qemasen is high upon their slopes. Ridges of rock extend northward from the chain. Limestone it is called. The weather of the world has gnawed away at the rock and left a field of pinnacles, like pieces upon a chessboard, arrayed along the north slopes. The Qemasen, as it grows into a large river, cuts through the slopes and winds about the vast rocks." Tawen is the capital of the Peoples and the land known as Teltelkes Heheces. The town of over 40,000 (in a nation of about 15 million spread over half a million square miles) sits in the center of island, at the base of mountains to the south, looking out on the plains that lead to the great inland sea, Snecec Sheli. Tawen is the spiritual and political capital, Hearths of eight Peoples are present, split between the Upper and Lower halves of the city. "Tawen, our city, is built into one of these spires, where the river has carved an opening in the plains. The side of the stone was revealed and ages ago a collapse created a hollow in the stone. 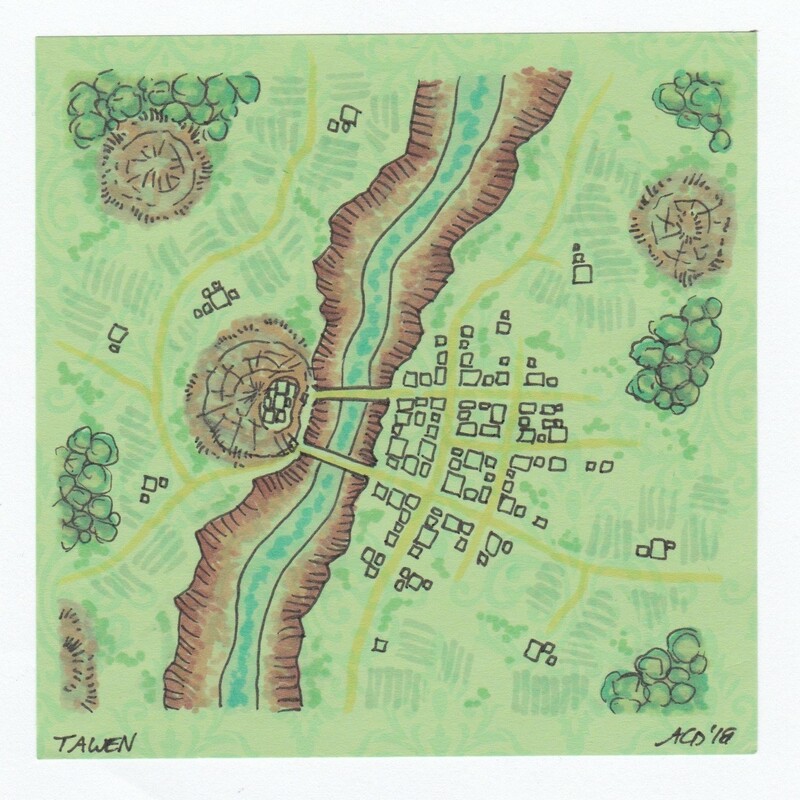 There the first of my Peoples built the Lower City of Tawen. Up in the air, atop the pinnacle, there is a hollow. 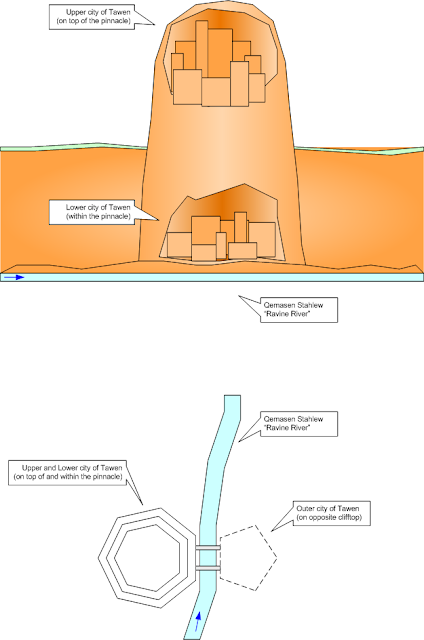 In that opening, Phoenat's People built the Upper City. Tunnels have been carved through the stone, shored by magic and man, to connect the two." A great limestone pinnacle rises from the ground; the river Qemasen Stahlew (“Ravine River”) carves a path along its eastern side. Comprised of three parts, the oldest portion known as the Lower City nestles in a huge opening in the stone along the river bank. Above, in the air, the slightly younger Upper City is perched in the top of the limestone. "As Tawen grew, other Peoples and visitors settled in the area. Soon the pinnacle began to become crowded. The Outer City was begun across the Qemasen and two great bridges built to connect it to the spire. Tawen thus continues to grow up, down and outward as you will soon see." The warrens of the bottom of the pinnacle are the home to the People of the Fields: Mouse – “Ketan”; Squirrel – “Toepsipaen”; Rabbit – “Sqeweo” and Rat – “Hewt.” Many craftspeople make their homes here. Docks stretch out onto the river, launching boats that make their way north to the inland lake. In darker corners, Rats run the local Thieves Guild and other unsavory businesses. Across the river, spanned by bridges of fine white stone, lies the great semi-circle of the Outer City. Here are the homes of members of the other Peoples and those of other races who make their home on this island nation. 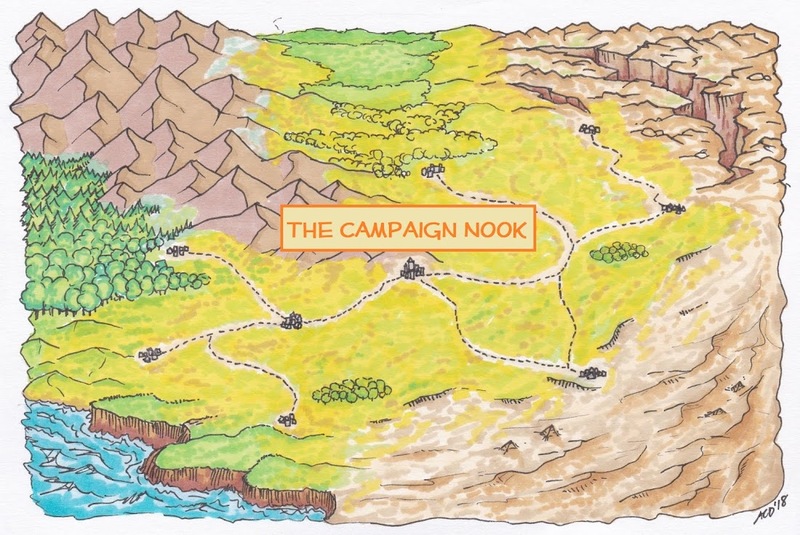 Notable buildings include various Guild halls, including those of Magicians, Merchants and Adventurers, lesser government buildings, and walled estates of local rich and stores of all types. Narrow walkways, ladders and an elevator lead from the Outer City to the river below.